If the Lab on a Chip HOT articles are anything to go by, using microalgae as a feedstock for biofuel is definitely a flourishing research area. Microalgae is a particularly attractive feedstock as it grows rapidly, has a large oil content, and can be grown pretty much anywhere. David Sinton and co-workers at the University of Toronto have previously published in Lab on a Chip on this topic and have now reported their work on optimising the conditions for converting microalgae ‘biomass’ into crude biofuel (‘biocrude’). The process by which this is achieved is known as hydrothermal liquefaction. High temperatures and pressures are employed to break down the organic compounds from the biomass into the oils that make up biocrude. a) Fluorescence images at increasing reaction time; b) Fluorescence and dark-field imaging of fluids at inlet and outlet. The Sinton lab have developed a microfluidic chip in order to accurately control the reaction conditions of this process and also to study the effect of changing conditions on the biofuel that is formed. The continuous flow and small volume of the chip allow very fast heating of the algal slurry so reaction times can be accurately studied – in fact the heating rate achieved is the fastest reported to date. The slurry was analysed in situ by fluorescence imaging and changes to the fluorescence signature were monitored. Over the course of the reaction, the fluorescence signal due to chlorophyll disappeared and a new peak developed, indicating the formation of the aromatic compounds that are a characteristic component of crude oil and plant based oils. Further analysis of the samples collected from the chip outlet found that the energy content (measured by the elemental composition) of the biocrude reached saturation after short reaction times – much before the fluorescence signal stopped changing. In addition to this, non-fluorescent droplets could be seen inside the reaction chamber, as shown in the diagram on the left, which were presumed to comprise of aliphatic oils. These findings indicate that analysis of the elemental composition alone is insufficient to measure chemical conversion to biocrude and methods such as fluorescence imaging should also be employed. 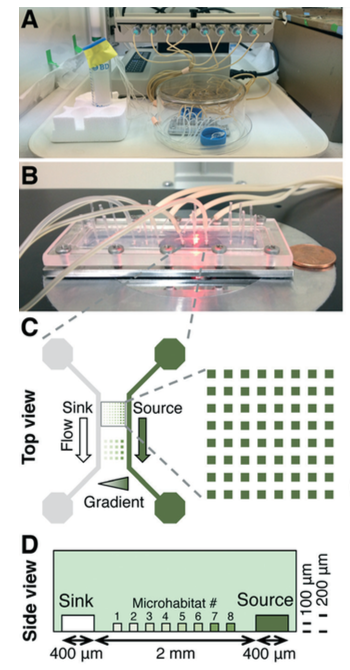 This work is the first example of using a microfluidic platform in hydrothermal liquefaction research and just goes to highlight the versatility of lab-on-a-chip systems. *Access is free through a registered RSC account until 29/02/2016. Differentiation of stem cells into beating cardiac tissues on paper! The Biomicrofluidics System Group at the Dalian Institute of Chemical Physics in China have published an exciting paper in Lab on a Chip where they have used paper as a material to grow and differentiate human pluripotent stem cells. Recently, there has been much research into generating biocompatible materials for creating microenvironments for the growth of stem cells, with the aim of improving their regenerative potential. Using paper as the material has several advantages over the conventional polymers – it is cheap and readily available, it is biocompatible, and the bundles of cellulose microfibers that make up paper provide a porous 3D structure. The authors used three different types of paper to identify which were best for stem cell growth – printing paper, filter paper, and nitrocellulose membrane. The paper was pre-coated with the required gels and the stem cells were seeded onto the surface. Initially, the stem cells were differentiated into cardiomyocytes prior to being added to the paper to test if the differentiated cells were able to grow on the different types of paper. The cells aggregated on both printing and filter paper and demonstrated spontaneous beating function, but not on the nitrocellulose membrane. These tissues also maintained their beating function for up to three months. The stem cells were then added to the paper prior to differentiation and the required cardiac differentiation procedures were carried out. The cells differentiated to the cardiomyocytes on all three paper types, however the cardiac-specific marker was only expressed weakly on the nitrocellulose membrane. Within two weeks a strong beating function was observed for the printing paper, but not the other paper types. 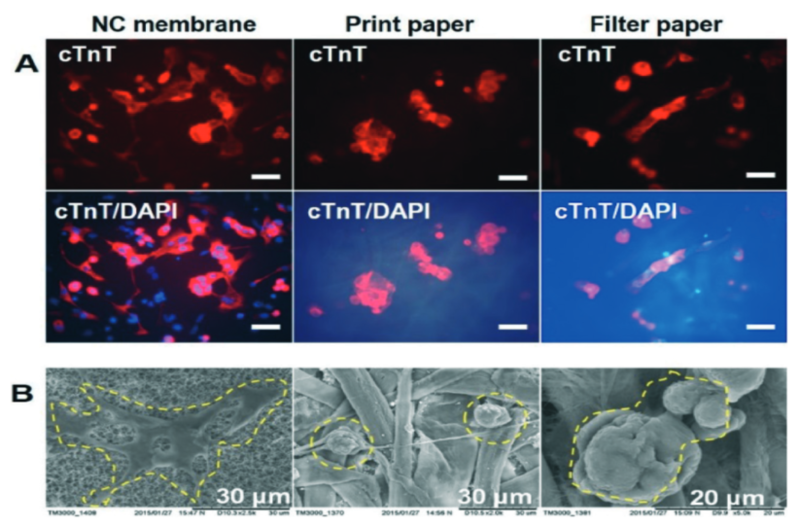 The authors suggest the printing paper had a better pore size to support the cells than the filter paper, while the nitrocellulose membrane didn’t have a favourable microstructure to support growth of cardiac tissue. Along with this article, there are some impressive videos showing the cardiac tissue beating that are well worth a watch! Blood analysis is usually the first step involved in the diagnosis of various diseases, such as typhoid and malaria. The biochemical and cellular equilibrium of blood is very sensitive to physiological variations occurring in the body at various disease stages. Thus, a fast and accurate examination of blood properties is essential. The morphological and biochemical changes in erythrocytes are used as the pathological signatures of various diseases. Flow cytometry is used to examine blood cells, which requires hydrodynamic sheath flow alignment and fluorescence antibody labelling, making it time-consuming and expensive. Advanced light scattering techniques (such as digital holography) are often seen as suitable alternatives, as they provide fast and label-free measurements. In a recent Lab On A Chip article, Netti et al. from the Italian Institute of Technology, in collaboration with scientists from Germany and Russia, presented a camera-based light scattering approach, coupled with a viscoelasticity -induced cell migration technique. This new system is used to characterise the morphological properties of erythrocytes in microfluidic flows. 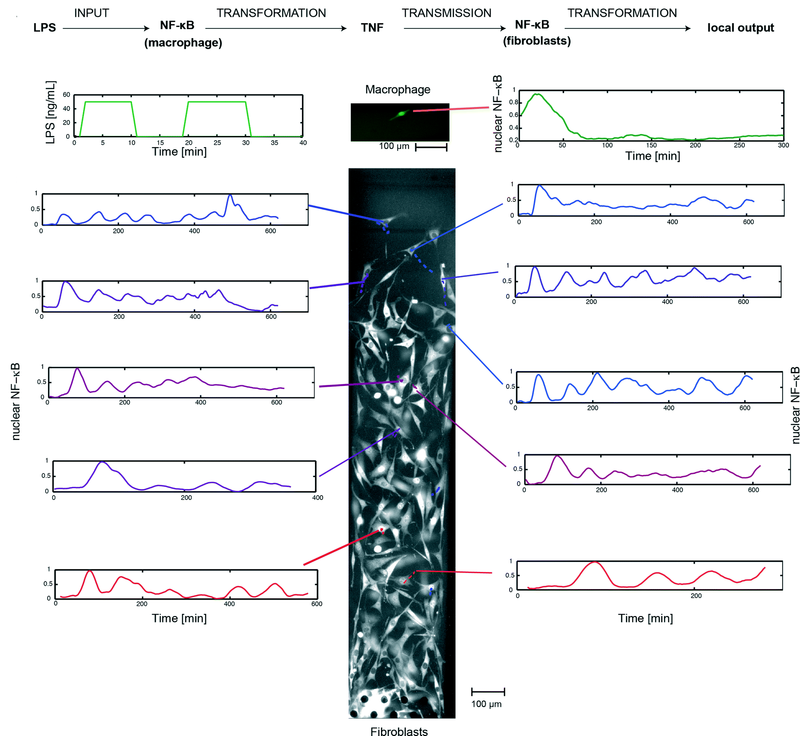 They obtained light scattering profiles (LSPs) of individual living cells in microfluidic flows over a wide angular range and matched them with scattering simulations to characterise their morphological properties. A healthy erythrocyte diameter lies between 6 and 9 µm. The diameter values obtained from the experiment lie between 7 and 8.3 µm, which is in good agreement with the existing literature. ‘The results demonstrate the ability of a rapid and cost effective way to measure the average dimensions of an erythrocyte population which can be easily related to the health of a patient,’ concludes Netti. To gain deeper insight into LSP acquisition and simulation, you can read the full article for free* by following the link below. *Access is free until 27/09/2015 through a registered RSC account. Researchers from the Kaneko Higashimori Lab at Osaka University and the Arai Lab at Nagoya University have observed an interesting phenomenon when studying red blood cells in microfluidic channels. Instead of flowing along the channel in a smooth motion as expected, some cells bounce back and forth between the channel walls in a pinball-like motion at much slower speed. In addition to these ‘cell pinballs’, there are also cells that move at a similar reduced speed, but don’t hit the channel walls. This altered behaviour could have detrimental effects on microfluidic devices, caused by non-uniform movement of the cells in the channels. In order to prevent these potential problems, the authors have investigated the cause of this behaviour. They noted that cell pinballs only occur when the saline medium is hypotonic, as this causes the cells to inflate due to intake of water. By attaching microbeads to the cells and using a high speed camera, the motion of the cells were studied in more detail. The pinball cells rotated clockwise as they moved to the left of the channel and anticlockwise as they moved to the right of the channel (relative to the direction of the flow). This observation, combined with the knowledge that the cells were inflated in the hypotonic solution, led the authors to believe that the pinball-motion was occurring due to both the shape of the red blood cell and contact with the channel walls. 3D images obtained using confocal microscopy showed that the upper and lower surfaces of the cells were flattened, confirming that the cells were in contact with the walls. By studying the different possible deformations of the inflated red blood cells when subjected to flow, the authors found that the contact line (between the cell and wall) and the centre line of the cell were not the same. This explains both types of unexpected cell motion – if the contact line is downstream of the centre line, the cell is unstable to rotational motion and this causes it to move at an angle to the flow, leading to the pinball cells, whereas if the contact line is upstream of the centre line the cell is stable to rotational motion and no displacement occurs, leading to the slow moving non-pinball cells. From these studies, the authors were able to propose mechanisms that successfully explained the two types of altered red blood cell behaviour in hypotonic solutions, and hopefully in the future this should allow microfluidic systems to be used which will avoid this pinball-motion occurring. *Access is free until 06/09/2015 through a registered RSC account. 3D technology has revolutionised the entertainment industry by offering viewers the experience of being part of the action, going on in a movie rather than simply watching it. Thanks to 3D technology, we can sky walk hand in hand with George Clooney in ‘Gravity’. The history of 3D technology can be drawn all the way back to the invention of the stereoscope by David Brewster in 1844. Last two decades have seen 3D technology replacing 2D in all walks of life, ranging from entertainment, physics, microelectronics, tissue engineering and regenerative medicine. For e.g., microelectromechanosensors (MEMS) are 3D devices produced by using soft lithography techniques. MEMS installed in air-bags in the cars have saved thousands of lives by sensing pressure levels during accidents. Can we use 3D technology to have a better look at the complex events happening at cellular level? One of the major challenges in tissue engineering is that the conventional approaches are mainly limited to 2D monolayers systems and do not allow manipulation of complex multilayer tissue. Cells grown on 2D substrates may respond and differentiate distinctly than those in more physiologically relevant 3D environments. The emergence of 3D technology has enabled scientists to mimic the exact cellular environments and helped to provide better insights into the cell signalling, migration and differentiation in cells. One of the ways of mimicking the cellular architectures is bio-etching which involves subtractive manufacturing. 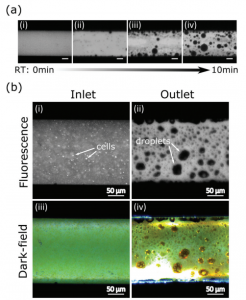 Bioetching of monolayers of cells in response to laser cuts or scratch assays is achieved by using 2D cell culture studies. But the actual biological systems such as tissues and organs are much more complex and cannot be mimicked using simple monolayers. For long time, scientists have been working on developing better technologies to address this problem. One of the ways to achieve this is 3D bio-etching. William C. Messner et al. 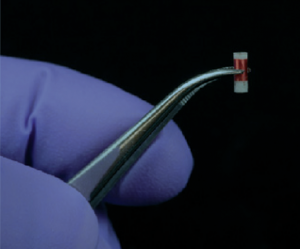 from Tufts University in a recent article in Lab on a Chip explain the utility of 3D bioetching technique to create and shape 3D composite tissues using a microfluidics based approach. The ability to shape the 3D form of multicellular tissues and to control 3D stimulation will have a high impact on tissue engineering and regeneration applications in bioengineering and medicine as well as provide significant improvements of highly complex 3D integrated multicellular biosystems. For more than a century, researchers have been studying how the body detects and defends itself against foreign invaders.1 This process relies on a series of cell-to-cell signaling, starting with the detection of common pathogen components by receptors of immune cells. For example, macrophages, a surveillance immune cell, recognize bacteria using the Toll-Like receptor 4 (TLR4), which binds to lipopolysaccharide (LPS) found in the membrane of gram-negative bacteria. Upon recognition of danger signals, immune cells engulf and degrade the invaders and activate NF-κB, an intracellular protein that, when activated, migrates into the nucleus and turns on inflammatory response genes. For immune cells, this initiates the secretion of signaling mediators such as tumour necrosis factor (TNF), which helps remove invaders by dilating local blood vessels and recruiting other immune cells. The microfluidic device, formed from polydimethylsiloxane (PDMS), comprises a deflectable membrane sandwiched between a flow layer and a control layer. The flow layer houses supply channels and cell culture chambers, while the control layer regulates input, output, and segregation of these chambers using solenoid-actuated valves. 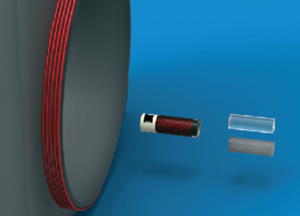 As shown in picture 1, the chambers for the sender cell (chamber A) and receiver cells (chamber B) can be segregated for mono culture or connected for co-culture, depending on the state of the reversible separation valve. In mono culture mode, the sender cell can be stimulated independent of the receiver cells, whereas in co-culture mode, the signaling mediators secreted by the sender cell can be broadcasted to the receiver cells via diffusion. Using this system, the researchers implemented a single-cell model of inflammation arising from bacterial infection (picture 2). This model begins in mono culture mode, with a single macrophage seeded in chamber A and a population fibroblasts seeded in chamber B. Inflammation was initiated by stimulating the macrophage with short pulses of bacterial LPS, leading to the activation of NF-κB and TNF secretion. Subsequently, the device was switched to co-culture mode, allowing the secreted TNF to diffuse across the fibroblasts and activate their NF-κB signaling. By tracking the movement of NF-κB in the nucleus of individual cells, the researchers, for the first time, mapped the spatiotemporal distribution of immune response to bacterial infection. They demonstrate that a single macrophage can activate and control over 100 fibroblasts up to 1 mm away, and that fibroblasts located farther away exhibited a time-delayed activation profile and fewer NF-κB oscillations (between the nucleus and cytoplasm). Furthermore, they observed that the NF-κB signaling in some fibroblasts can linger for up to 10 hours, demonstrating that a brief exposure to pathogenic signal can induce long-term inflammatory response in nearby cells. 1. K. M. Murphy, Janeway’s immunobiology, Garland Science, 2011. 2. L. A. J. O’Neill, D. Golenbock and A. G. Bowie, Nat Rev Immunol, 2013, 13, 453-460. 3. T. Frank and S. Tay, Lab on a Chip, 2015, 15, 2192-2200. 4. 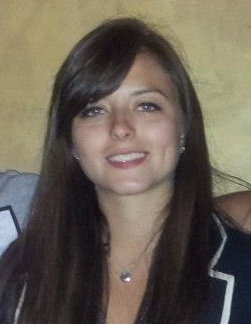 M. Junkin and S. Tay, Lab on a Chip, 2014, 14, 1246-1260. 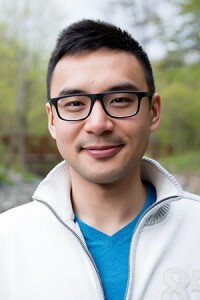 Alphonsus Ng is a postdoctoral fellow under the supervision of Dr. Aaron Wheeler in the Department of Chemistry and the Institute of Biomaterials and Biomedical Engineering at the University of Toronto. His research focuses on the development of microfluidic methods for heterogeneous immunoassays, cell-based assays, enzymatic catalysis, sample preparation for proteomics, and chemical synthesis. *Access is free until 24/08/2015 through a registered RSC account.